On 19 September1732 Johannes and Anna Albrecht arrived in the port of Philadelphia from Rotterdam on the Johnson. They were very likely emigrants from the Rhineland and of the Lutheran faith with pietistic inclination. Into their home near Pottstown, Pennsylvania, a second son, Jacob, was born on 1 May 1759. After brief service in the Revolutionary War he was married to Catherine Cope in 1785, bought a farm, and established a tiling business in Lancaster County, Pennsylvania, near the flourishing Ephrata Cloister. 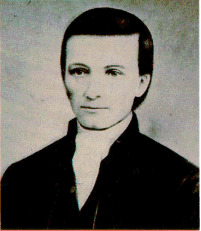 Dissatisfied with the Lutheran Church in his community, Albright temporarily associated with the Methodists but soon began to preach among his German neighbors and to Germans throughout eastern and central Pennsylvania, Maryland and Virginia, for whom he believed no adequate religious culture was being provided. By 1800 his followers were so numerous that he established the first classes of the United Brethren denomination and in 1803 held an official conference of his coworkers. He was named a bishop of the church in 1807 and charged with the responsibility of drafting a form of government and order, which he left incomplete at his premature death on 18 May 1808. He lies buried in Kleinfeltersville, Pennsylvania, where the Evangelical Church (later the Evangelical United Brethren Church), of which he was the founder, erected a memorial church in 1850. Albright, Raymond W. A History of the Evangelical Church. Rev. ed. Harrisburg, Pa., 1945: 21-82. Albright, Raymond W. "Albright, Jacob (1759-1808)." Global Anabaptist Mennonite Encyclopedia Online. 1955. Web. 18 Apr 2019. http://gameo.org/index.php?title=Albright,_Jacob_(1759-1808)&oldid=132327. Albright, Raymond W. (1955). Albright, Jacob (1759-1808). Global Anabaptist Mennonite Encyclopedia Online. Retrieved 18 April 2019, from http://gameo.org/index.php?title=Albright,_Jacob_(1759-1808)&oldid=132327. Adapted by permission of Herald Press, Harrisonburg, Virginia, from Mennonite Encyclopedia, Vol. 1, p. 36. All rights reserved. This page was last modified on 17 July 2015, at 19:13.